Plants 24-100 cm. Leaves 2-4, spreading to ascending, gradually to somewhat abruptly reduced to bracts distally; blade lanceolate to lance-elliptic, 5-40 × 0.6-6 cm. Spikes rather dense. Flowers resupinate, showy, orange; dorsal sepal entire or rarely emarginate; lateral sepals reflexed; petals linear to linear-cuneate, margins apically fringed; lip porrect to descending, oblong to broadly ovate-spatulate, without basal thickening, 8-19 × 4-18 mm, margins deeply filiform-fringed; spur slenderly cylindric, rarely slightly clavate, 20-35 mm; rostellum lobes scarcely to markedly curving forward, slightly spreading, angular-elongate; pollinaria with stalks nearly straight to curved forward; pollinia remaining enclosed in anther sacs; viscidia orbiculate; ovary slender, 12-27 mm. Flowering (Jun--)Jul--Sep. Moist sandy and peaty meadows, marshes, prairies, pine savannas, open woods, wet wooded flats, seeping slopes, roadsides, dry wooded slopes, sphagnum bogs; 0--1700 m; Ont. ; Ala., Ark., Conn., Del., D.C., Fla., Ga., Ill., Ind., Ky., La., Md., Mass., Mich., Miss., Mo., N.J., N.Y., N.C., Ohio, Okla., Pa., R.I., S.C., Tenn., Tex., Va., W. Va. Selection for longer spurs in response to local pollination pressures on the southeastern Coastal Plain has been documented in Platanthera ciliaris, but the extent of variation is minimal, and the situation does not appear to be comparable to that in P. blephariglottis. 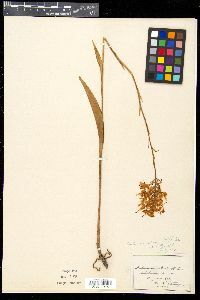 Hybrids of Platanthera ciliaris with P. blephariglottis are P. × bicolor (Rafinesque) Luer and with P. cristata are P. × channellii Folsom; until recently the latter was confused with P. chapmanii (J. P. Folsom 1984). Perennial herb 24 - 100 cm tall Stem: single, erect, somewhat stout at base, deep green, hairless, leafy but leaves somewhat abruptly reduced to bracts upward. Leaves: two to five, alternate, spreading to ascending, stalkless (base sheathing), green, hairless, non-toothed, more or less lance-shaped with long tapering pointed tip, and raised lengthwise ridge or keel underneath. The leaves range in size from 5 - 40 cm long and 0.6 - 6 cm wide with the largest low on the stem and then somewhat abruptly reducing in size upwards. Inflorescence: a single, erect, terminal, hairless, rather dense, rounded to short, spike-like cluster of twenty to thirty stalked flowers with each flower subtended by a bract. The non-toothed, hairless, 1 - 1.5 cm long, 3 - 4 mm wide, narrowly lance-shaped bracts end in narrow pointed tips. Flowers: stalked, showy, rich orange (some fade to yellowish orange), hairless, over 1 cm diameter, bilaterally symmetric with center sepal and upper petals forming hood above the prominent, highly modified, fringed lip petal, which has base modified into a slender nectar spur. The reproductive parts of stamens, stigma and style are fused into a column above the 1.2 - 2.7 cm long slender inferior ovary. Sepals: three, petal-like, orange, 4 - 9 mm long, 4 - 6 mm wide, concave, non-toothed, hairless. The two egg-shaped to nearly round lateral sepals are reflexed or spread to the sides of the lip petal, while the more oblong-elliptic central, uppermost sepal curves forward and over the closely positioned lateral petals, together forming a high hood over the lip petal and column. Fruit: several, stalked, ellipsoid capsules. Roots: few, fleshy, tuberous, thickened but rather long. Lateral petals: two, close together, ascending and curving forward, orange, hairless, 4 - 5 mm long, 1 - 1.5 mm wide, linear (or slightly wider beyond middle) with fringe at tip. Lip petal: one, central, lowermost, projecting slightly forward to downward, orange, hairless, oblong-elliptic, 0.8 - 1.5 cm long, 2 - 4 mm wide, but appearing as wide as 0.5 - 1.8 cm due to heavy fringe of long (up to 1 cm, longest along sides) threadlike hairs, which may branch. The base of the lip petal is modified into an orange, long (2 - 3.5 cm), slenderly cylindric spur. Similar species: Platanthera ciliaris is the only orange fringed orchid in our area, but the flowers are very similar to the white-flowered P. blephariglottis. In fact, the two species do hybridize to form P. x bicolor, which is very similar to both parents, except for the flower color being either pale yellow, buff, or bi-colored with a white lip and orange sepals and lateral petals. Habitat and ecology: Very rare, in acid soils, primarily bogs, moist sand flats, peaty sand prairies, but also can be in open damp sandy meadows or marsh borders. As shade increases, populations decline and will disappear in dense shade, thus management requires periodic disturbance (like fire) to reduce shade cover. Notes: The range of this beautiful orchid is centered more around the Atlantic Coastal Plain with the Chicago Region being the farthest northwest extent. More interesting though is the large gap (disjunct) between the Chicago Region and the edge of the main species range by over 200 miles. Etymology: Platanthera comes from the Greek words platys, meaning flat or broad, and anthera, meaning anther, which refers to the wide anther of the genus. Ciliaris comes from the Latin word cilium, meaning "fringed with hair", in reference to the long hairy fringe of the lip petal. In marshes, moist, sandy borders of lakes and sloughs, prairie habitats, and low, open and sandy woods. This species was formerly not rare but is now becoming scarce. Its distribution is restricted to our northern counties and besides those indicated on the map it has been reported from Marshall County. Stem 4-10 dm; lower 1-3 lvs lanceolate, to 15 נ4 cm; upper several lvs abruptly reduced; infl compact, cylindric, 5-15 נ5 cm; fls many, orange; sep broadly oval to obovate, 6-8 mm, the lateral ones spreading like ears; lateral pet linear-oblong, shorter than the sep, lacerate at the summit; body of the lip linear-oblong, 10-16 mm, long-fringed; spur 18-30+ mm, usually directed down or back. Bogs, fields, and woods; Mass. to Mich., Wis., and Mo., s. to Fla. and Tex. July, Aug. (Blephariglottis c.; Platanthera c.) A hybrid with no. 12 [Habenaria cristata (Michx.) R. Br.] is H. أhapmanii (Small) Ames.